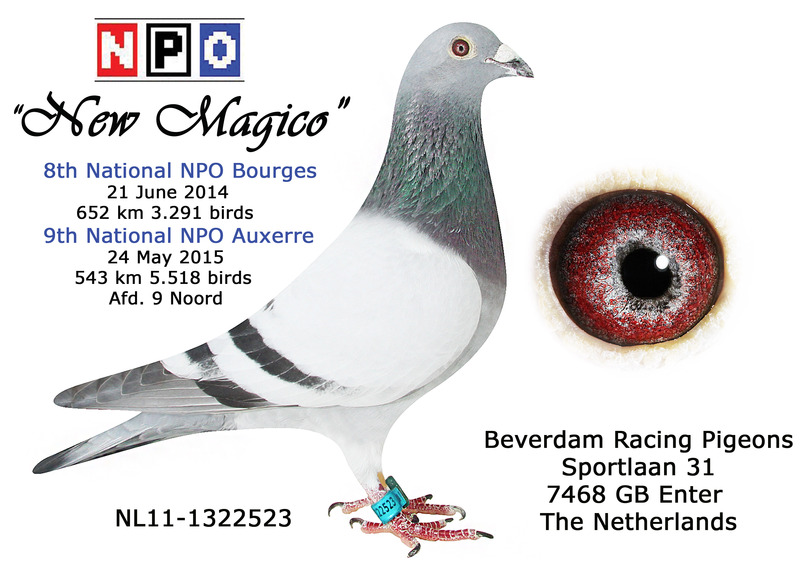 NL11-1322523, NEW MAGICO, NATIONAL NPO BOURGES SENSATION IN 2014 AND AUXERRE 2015! Sire is NL09-5914499, BLES MAGICO, son of NL04-2198731, MAGICO, 1st NATIONAL ACE PIGEON MIDDLE DISTANCE NPO 2006, 1st Creil 5.847 birds, 1st Morlincourt 2.573 birds, 2nd Sens 4.656 birds, 2nd Pommeroeul 3.143 birds, 1st Peronne 1.616 birds..........3rd NATIONAL ACE WHZB 2006, 5TH BEST OF THE BEST Sprint Middle Distance Competition. Only raced 8 following races in 2006 !!!! He is bred by John Rockx Zegge, from NL97-1716278, ORLEANS DOFFER ROCKX, bred by Ad Schaerlaeckens from NL93-5303224, ORLEANSDOFFERTJE and NL92-5212284, daughter LICHTE ORLEANS and sister NATIONAL ACE van de Veeke. Dam is NL98-1397245, daughter of NL96-2473223, KAPOTTE STAART bred by Ad Schaerlaeckens from two winners NL91-5085042, 1ST Etampes 1.359 BIRDS AND 1ST Etampes 503 birds, with NL95-2067225, 1st Cambrai 962 birds and 1st Strombeek 954 birds, daughter ORLEANSDOFFERTJE ! 245/98 dam is NL97-9773669, SUPERKWEEKSTER ROCKX, bred by Ad Schaerlaeckens from his famous NL93-1059875, WOUNDED KNEE and NL94-1669862, daughter BLUE MATTENS and SISSI, FULL SISTER of NL96-5660164 1st 24.100 birds ! His dam is NL01-1488482, MISS TELETEKST, 3rd Morlincourt 13.277 birds, 4th Morlincourt 8.420 birds, daughter of NL99-1944527, GOLDFINGER, 7th Teletekst BOURGES, 1st Bourges 926 birds, 1st Peronne, 2nd Orleans son of NL95-1483095, BARON, brother ACE FOUR and SUPERTJE 144 Schaerlaeckens, when paired to NL95-1219169, QUICKSILVER, also dam of SUPER CAMELION BONFIRE ! Dam is NL10-1681758, BUBBLES BARON, bred by Gerard and Bas Verkerk, daughter of NL05-1394707, DE BARON, fantastic producer of best 2009 youngsters, 1st Chimay 3.713 BIRDS, 1ST Reims 2.247 birds, 1st Reims 2.381 birds, 2nd Marche 4.098 birds, 4th Huy 4.217 birds, .............son of NL95-1941948 BIG THUNDER and NL02-1635222, CINDERELLA, 1ST NATIONAL ACE PIGEON ALLROUND 2003, 2ND NATIONAL ACE PIGEON ALLROUND WENC, 4TH ALL EUROPE DORTMIUND, 2ND NATIONAL ACE HEN WHZB 2003.........daughter of MAGNUM and MISS SAIGON. Dam is NL02-1635264, BUBBLES, bred by Ad Schaerlaeckens daughter from NL93-1059875, WOUNDED KNEE and NL01-1994127, VUIL BLAUW, from son ORLEANS DOFFERTJE X BEAUTY and sister INVINCIBLE. This hen is full-sister of 2nd National NPO Blois 2008 4.673 birds and 7th NATIONAL all Holland, BLOIS 67.000 BIRDS, 2008 ! !